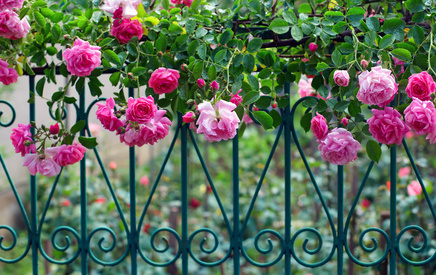 Most probably, the most classic-looking fences are the wrought iron fences. A few hundred years back, there were only a few kinds of fences. Crude things were used by the farmers and the villagers for making the fence and only the royal and wealthy families had the fences made out of wrought iron. It was a sign of influence and power. Today, after those few hundred years, we can see all sorts of fences made up of wrought iron competing each other in elegance and class. In today’s date, more than 90,000 businesses offer the fencing products and services in the US. The fencing industry makes about 51 billion dollars revenue in a year. Having all these options, the house owners can come together with a fencing contractor who meets their requirements and budget. For so long, wrought iron fences were considered for only the large and stately houses. This ethereal and admirable fence was famous as the ‘ornamental iron.’ In today’s time, ornamental iron and wrought iron means the same. Wrought iron is brilliant and can be custom-built as per the specifications. However, for a lot of people, it is mostly more economical to dress up the fence which can be done with decorative accessories and stock panels. The accessories which can be used for wrought iron fences are castings, scrolls, pickets, circles, arched tops, etc. Iron fences surely need a more extensive starting investment than the wooden fences, vinyl fences, composite fences or chain link fences. It can also rust in case these are not taken care of properly. Nonetheless, iron fences give more customized, stylish appearance and are perfect enclosures for gardens and pools. The beauty of the wrought iron doesn’t only come from its strength and its toughness, but also from its ductility and malleability. The fact that something as substantial like iron can be shaped into alluring and graceful designs makes it an ideal combination of aesthetics and strength. 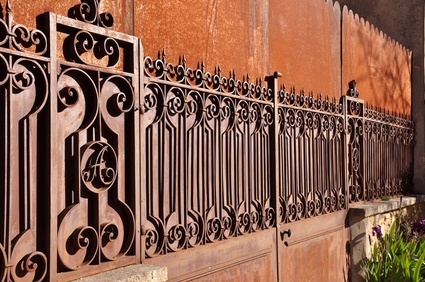 The resiliency and flexibleness of wrought iron let the customers to custom design and personalize their iron projects as per their style and vision. It is beautiful to see the ingenious energies of people and their inputs on either their doors or gates which they build. Unique ideas and originality are always welcomed and appreciated. The design ideas are countless ranging from cool contemporary layouts to warm rustic accents. Call us right away on 310-692-8060 to discuss your wrought iron fencing needs.